Skateboard/Longboard Backpacks and Travel Bags at Concrete Lines. Buy now with Afterpay! For all your Skateboard Bag needs, whether it is a simple backpack to one you can strap a skateboard to the outside or one for some more serious travel on the plane! Keep your hands free and your small items close with this map bag. Compact and lightweight, it’s made of woven polyester with a striped nylon shoulder strap. It has a main pocket with a fold-over buckle closure, plus an extra front pocket for added storage. DGK Check Print Angle backpack. All over DGK Check Print bookbag from Dirty Ghetto Kids. Foam padded back panel with DGK ALL DAY stitching. Check printed adjustable shoulder straps with mesh padding. Laptop sleeve and mesh zip pocket inside. Front diagonal zipper pocket with organizational pouches. Side pockets with DGK tag. Faux leather decorative DGK All Day patch at front. The classic DGK Craftsman Angle Deluxe Backpack features DGK’s all over ‘Roman Marble’ print. This Diamond Supply Co. Camo Duffle Bag screams quality and functionality! The Diamond Supply Co. Simplicity Backpack is all style, looks amazing and comes with all the bells and whistles! Just throw in your toothbrush, shaver or anything else that you travel with this waterproof toiletry bag from Diamond Supply Co. and travel in style! Repeat Diamond simplicity print on a polyester twill. Evolves Version 2 backpack is here. Meet the swiss army knife of E-board backpacks! This newly designed backpack is top shelf quality, feel, look and has unique functionality. The backpack has loads of storage room, pockets and you can even pack your Evolve electric skateboard in it! Pack up all your gear in this Grizzly Day Trail Backpack! The perfect combination of style and substance, it features the iconic Grizzly logo to show off your rad skater cred. If you’ve been searching for a bag that can fulfil all your needs and then some, look no further! Printed front panels, with embroidered bear on back. Official Headwear presents the Hip Utility Black Bag. Snag the multi-functional Official Black Utility Bag and easily store your cash, keys and other daily accessories! This quality hip pack comes with three main storage options accompanied with a stylish 3M reflective logo print. Perfect for when skating through the city or simply enjoying those days kicking it with your mates day and night. Official Headwear presents the Official Hip Utility Black/Grey Bag. Official Headwear presents the Melrose Black Backpack, made from high quality materials inspired from street and skate culture. This backpack features an adjustable shoulder strap that slips over your shoulders with a mesh back piece that has ‘Official’ in a moderately reflective silver print. The bag itself features a front zippered mesh pocket with ‘Official’ print logo and a larger zippered pocket. Official Headwear presents the Melrose Chest Utility White Bag. The Official Chest Utility White Bag features a 4 point strap that slips around your torso and over your shoulders by two buckle straps with a mesh back piece that has ‘Official’ in a moderately reflective silver print. The bag itself features a front zippered mesh pocket with ‘Official’ print logo and a larger zippered pocket. Official Headwear presents the Official Melrose Shoulder Black Bag, made from high quality materials inspired from street and skate culture. This shoulder bag features an adjustable shoulder strap that slips around your torso and over your shoulders by one buckle strap with a mesh back piece that has ‘Official’ in a moderately reflective silver print. The bag itself features a front zippered mesh pocket with ‘Official’ print logo and a larger zippered pocket. Official Headwear presents the Official Melrose Shoulder Red Bag, made from high quality materials inspired from street and skate culture. Be the coolest kid in school with this backpack! Stand out in the crowd with this cool Santa Cruz Skateboards logo’d backpack! Fit your whole life in one backpack! This Sector 9 The Field Bag is the perfect travel bag! Just throw everything in there, It will all fit and the best thing is it turns into a backpack. This Sector 9 The Lightning 11 Travel Bag is the perfect travel bag! Just throw everything in there, It will all fit and the best thing is it has wheels. The Sector 9 Sled Shed Travel Bag is the perfect budget friendly bag to carry your longboards in when travelling to skate events. Big enough for most boards, extra wheels and parts! Sk8kings custom designed gear bag features rugged canvas fully padded construction, heavy weave nylon handle carry straps and heavy duty stitching throughout for added durability. The lid zips open for full easy access to the contents and features a full-size zipper pocket on the inside lid. This bag is 100% custom made in So Cal to our specs. Perfect for hauling your gear for local road trips or when travelling by air. Ideal for up to 42″ deck sizes. The Spitfire Wheels Bighead Grey Backpack is a super tough and durable skate bag loaded with handy pockets and cool features. You get a great slide in laptop section and nicely padded shoulder straps and back section. You also get a massive Spitfire logo on the front for maximum style! 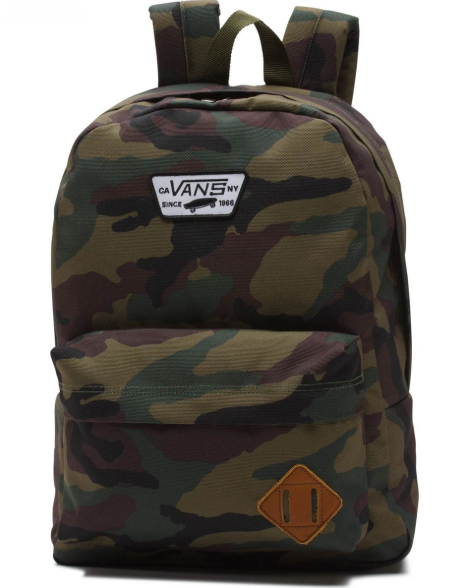 Vans The Old Skool II Backpack is a 100% polyester backpack featuring one large main compartment and a front zip pocket with an organiser for quick access.